And it's made of fiddleback maple. 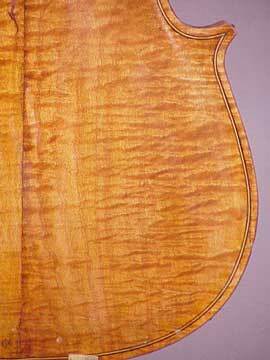 Also known as "flamed," fiddleback maple has even, parallel curls of figure in the grain. 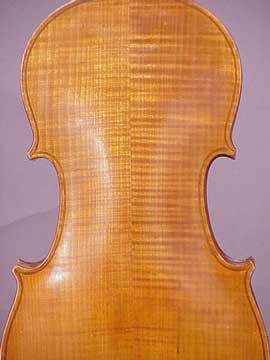 It's the most traditionally desirable kind of figured wood for violin and other instrument construction. The curls are irregular and interlocking. I suppose you'd simply call this "curly" or figured maple. Other hardwoods grow with parallel curls, although they are seldom referred to as having "fiddleback" figure.